As I watch my lovely, thoughtful, and very beautiful wife back the car out of the driveway, I’m reminded of an important life lesson. I first learned this lesson when I was training to be a pilot. My experiences in the air, and also my experience on boats, has taught me the value of having a target. This applies to life also. Several years ago I went with friends on a charter fishing trip out of Westport, Washington. The trip was rather uneventful until we came across a body floating in the water. Though I learned how to do the “dead-man’s float” in my swimming lessons as a kid, this was not an act. The man was truly dead. After pulling him aboard our vessel, we summoned the Coast Guard – and then we waited. A hush descended upon the passengers on our boat. We didn’t know what to say. Just then someone noticed that his watch was still ticking. “He takes a licking, but it keeps on ticking,” someone said – reminiscing about old Timex commercials. We laughed. 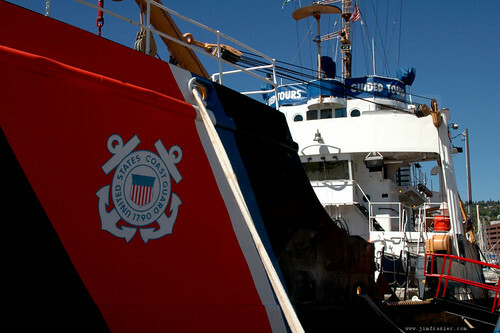 Soon enough, a 60-foot Coast Guard ship arrived. Because we were in the ocean, the transfer of this body was going to be more difficult than I expected. After providing a life vest, which we put on the man, they threw over a rope which we tied to him. Then we threw him back into the water for them to pull over to their boat. During all of this the Captain on our fishing boat asked if anyone had navigational experience. Because the water was so rough, the plan was to keep both boats moving so that we could stay close, and pointed into the 6-10-foot swells. I volunteered. 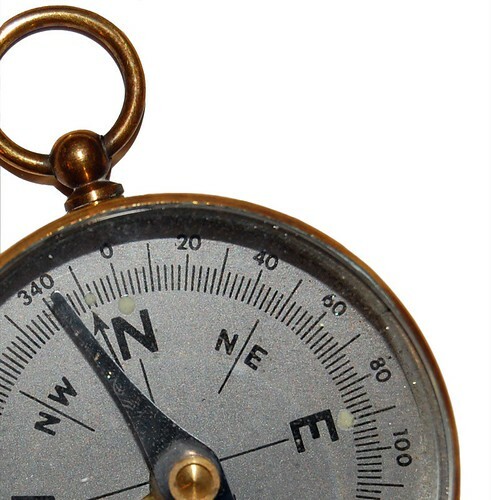 On a boat, or in an airplane, if their are no visible landmarks to aim for, the one at the controls relies on the compass (or other navigation tools). Whether it is ocean swells or wind gusts, there are forces trying constantly to knock the vessel off course. When there are landmarks, it is easy to just point the boat at that landmark and “keep’r steady!” My Grandfather taught me that when I was just a kid, while fishing at Round Butte Dam. Keeping a steady bead on your landmark will keep your course true. Fewer course corrections, and more distant landmarks, will allow you to arrive at your destination in the most efficient and quickest manner. You will use less fuel, it will take less time, and you are less likely to run afoul and crash into something that you didn’t intend to run into. Constant course corrections, my Grandfather taught me, just waste time and fuel. Life works the same way. If you can pick out a landmark, or destination, you are more likely to arrive there in the most efficient and safe manner. This seems like common sense, but I find that a lot of people don’t commonly live with a set of life goals, or personal vision. A lot of families have no mission statement. People tend to just go through life, worrying about the future, with no clear path laid out before them. It doesn’t have to be this way! Take some time, during the lazy days of Summer, and develop a set of five, or ten year goals for yourself – and your family. It’s been said, “If you don’t know where you’re going, you’ll certainly arrive there.” In the absence of clear landmarks to aim for, pull out your compass. What you don’t have a compass!? I’d suggest you find one right away. Find something, or someone, to guide you when things get foggy and you can’t see the path ahead. What are your priorities? What are your personal and family values? What are your longterm goals? Where do you envision yourself in five or ten years? Who do you want your kids to be when you grow up? What are your goals and priorities for your kids? What are your hopes – and how will you attain those? What are your fears? What are you doing to avoid those concerns? ← Did You Catch That?